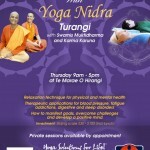 Yoga Nidra, an opportunity to come back to our centre. Yoga Nidra has long been an important and regular part of my yoga practice. I found it invaluable when I had a newborn baby, as a way to rest and restore in less than twenty minutes. And, even more interesting, after doing it consistently for over a decade, I’m starting to reap some of the more esoteric benefits of the practice that Swami Karma Karuna describes below. For these reasons, I’m delighted to see that Anahata Yoga Retreat is holding a Yoga Nidra Instructor Training aimed not just at Yoga Teachers, but any professionals who could benefit from adding Yoga Nidra to their skill set. I ‘sat down’ with Swami Karma Karuna, metaphorically speaking, to find out more about Yoga Nidra and the Training. KL: What is Yoga Nidra? And what is it not? Is it just a ‘relaxation technique’? Sw. Karma Karuna: The term Yoga Nidra is derived from two Sanskrit words, yoga signifying union or one-pointed awareness, and nidra, meaning sleep. During the practice of Yoga Nidra, one appears to be asleep in a relaxation pose, but the consciousness is functioning at a deeper level of awareness. In early yogic texts, Yoga Nidra is described as a meditative state of being in which there is total balance, deep peace and clarity. In modern times, it often thought of as simply a relaxation practice. However, when one understands the depths of this practice, it is an incredible tool for transformation with applications in yoga classes, education sectors, health fields, social areas and even corporate settings. There is some confusion as to what Yoga Nidra actually is and I hear people often say they have done Yoga Nidra at the end of their yoga class for 5 minutes or that they downloaded an app and visualized beautiful scenes for a little while. Laying in shavasana relaxing, visualizing or breathing is of course beneficial, however, it is not necessarily Yoga Nidra and does not have the same profound and transformative potential as a classical full Yoga Nidra. The Bihar School of Yoga (BSY) presented Yoga Nidra as a practice in the 1960’s. The roots of the majority of modern versions were inspired from the original Yoga Nidra book first published around that time. Even Richard Miller, who has coined I’Rest, writes in his book that he has drawn from the BSY Yoga Nidra in the development of his technique. Traditional Yoga Nidra has four essential stages, which are necessary to make it a Yoga Nidra; Internalisation, Body Rotation, Breath and Externalisation. There are four further stages, which are the transformative stages that allow the practitioner to go much deeper; sankalpa at two points, opposites and visualisations. Traditional Yoga Nidra goes far deeper than simply being a relaxation practice. It is a systematic experience, with each stage serving a very specific purpose that works with different areas of the brain and the nervous system. Each stage also leads the practitioner progressively deeper into the state of pratyahara or sense withdrawal, through to dharana, concentration and gradually to the state of dhyana or meditation. Ultimately, it is said that Yoga Nidra can lead one to the highest state of experience. Why is Yoga Nidra beneficial? How does it impact our body, mind and emotions? At it’s most basic level, Yoga Nidra is a practice that helps to calm the nervous system, turn on the relaxation response and create more equilibrium in the body, mind and emotions. Put simply, it creates a space from the over stimulation of a fast paced modern life. There is a systematic release of the gross and subtle tensions carried in the muscles, the breath, and the nervous system. However, Yoga Nidra also has an incredible transformative potential for people of all walks of life. When practiced regularly, studies have shown that the practitioner can reach a threshold between sleep and wakefulness, where contact with the subconscious and unconscious dimensions occurs due to a detachment from external stimuli and the internalisation of awareness. From the yogic as well as psychological perspectives, the roots of many physical, mental and emotional issues can be found in the unconscious and subconscious mind. The practice works directly on the mind to release impressions from the past and anxieties about the future. If the consciousness can be separated from external awareness and from sleep, it becomes very powerful and can be applied in many ways, for example: to develop memory, increase knowledge, creativity, let go of old patterns, heal oneself or transforms one’s nature. Why are you offering training specifically in Yoga Nidra? Running this Yoga Nidra course has been the unfolding of a dream I have carried with me for about 15 years. I taught weekend Yoga Nidra sessions on various Yoga Therapy trainings in the USA before Yoga Nidra was even known in most yoga circles. At the time, I used to feel frustrated by the fact that it was too short to really impart the depth and potential power of this practice and that people without a strong basis were potentially going out and sharing a powerful practice without enough grounding in it. I kept getting requests from yoga teacher’s of different traditions as well as from other healthcare sectors to give a training that gave them the ability to share such a wonderful practice without having to go through a full yoga teacher’s training as it either wasn’t applicable to their area or they already had training in a different style. Therefore, I developed the idea many years ago of a course that included theory, therapeutic applications, methods of use and enough depth and practice to get a solid grounding in the technique. It has taken me awhile to manifest it! Is this training only for Yoga Teachers? The course is designed as a continuing education course for yoga teachers but is also useful in other fields like health and education sectors. For yoga teachers, Yoga Nidra can be integrated into a yoga class, can stand on its own or be used with a specific therapeutic purpose. Many people come to yoga to manage health problems or simply to relax, so the ability to offer a practice like Yoga Nidra gives yoga teachers a very powerful tool to support their students. 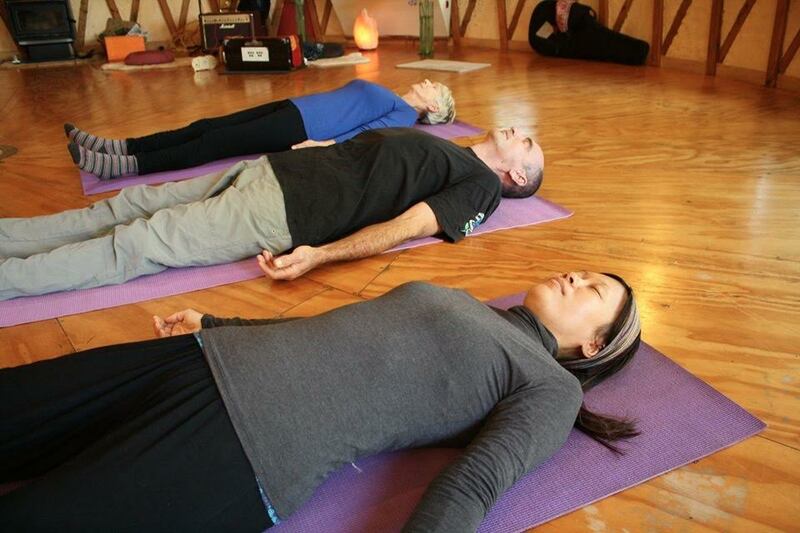 I have found some people mainly come to yoga for the Yoga Nidra once it is integrated into a class! In our last training, we had 8 yoga teachers, most of whom had some prior theory and practice in Yoga Nidra from their original teacher’s training courses. They expressed that this course gave them so much more depth than they imagined available, realising that their prior experience with Yoga Nidra had only been touching the surface of this incredibly profound practice. Who else would benefit from training in Yoga Nidra? The training gives a variety of health and education professionals the skills to support clients in the release of muscular, mental and emotional tensions, as well as addressing imbalances in a range of life and/or health situations. Teachers, nurses, doctors, psychologists, counselors and therapists could use the practices imparted as an adjunct to their work. Yoga Nidra and Restorative practices are currently being used in prison sectors, in drug and alcohol recovery, with senior citizens, in hospice, schools and other social areas. Life coaches, massage therapists, hypno-therapists and those in alternative health care may find it a useful in their work as well. Practices taught in this training have been found to be effective in the management of anxiety, depression, insomnia, PTSD, addictions, high blood pressure, heart disease, chronic fatigue, asthma, diabetes, fibromyalgia, breathing conditions, neurological conditions and motor impairment, chronic pain, stress issues and more, so anyone experiencing these difficulties or working in these areas could benefit. Yoga Nidra can also be used by anyone from any walk of life for relaxation or personal self-development. We are offering a 5-day immersion option for those who would like to learn or deepen the practice and get more knowledge, but are not interested to teach it or use it with clients. The 5-day immersion is practice focused but will include theory, benefits and science on Restorative Yoga, Breathing Methods and Yoga Nidra. The 9-day Instructors residential section takes it another step further, including applications in society, with different student or clients needs and ways to instruct and apply the practices. The Instructors Training continues with more than two months of online learning through readings, videos, personal practice, reflection exercises, deepening the theory and practice and applying the knowledge learned in the residential, all working towards a final teaching assessment. We go into great depth with the Yoga Nidra exploring each stage, as well as unfolding breathing methods, which form part of Yoga Nidra, but stand on their own as practices for deep relaxation with therapeutic benefits. Breath awareness, deepening breath capacity and the physiology and anatomy of the breath are explored. We recently added a Restorative Yoga component, sharing some of the classical Restorative Yoga theory and supported poses, theory and practice for the adrenal glands and include a strong emphasis on the Pawan Muktasana series. It is a simple and accessible practice that releases every joint in the body, opens up the pranic flows and can bring the practitioner to a deeply relaxed and meditative state as well. Who is leading the training, and what is their background? I, Swami Karma Karuna, am one of the leaders. I am a founding member and director of Anahata Yoga Health and Education Trust. I have been studying and teaching yoga in different settings and countries for more than 25 years. My main training has taken place at Bihar School of Yoga in India, where traditional Yoga Nidra and Yogic practices with therapeutic applications have been developed, taught and researched since the 1960’s. I have also done more than a 1000-hour training through the Australian Yoga Academy and been part of their teacher’s training team. My knowledge and applications of Yoga Nidra and Restorative Yoga practices come from years of personal experience and application with students from around the world with varying needs and of course myself! Being an active, prone to type A personality, these practices have been a life saver. I have taught internationally on various Yoga Teacher Trainings, Yoga Therapy courses as well as different social settings such as prisons, cancer patients, retirement homes, schools and more. I have also been producing Yoga Nidra recordings since the days of cassette tapes! 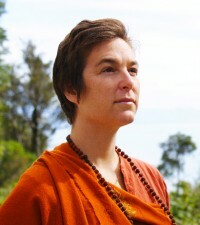 Sannyasi Pragyadhara is the other main teacher. She is a passionate and focused teacher who has been practicing Yoga for 15 years and developing her extending skills as a teacher over the last 9. She has spent 5 years as a student/resident and teacher at the Bihar School of Yoga in India where she completed a Masters in Yoga Psychology in 2005. Pragyadhara was also part of the yoga education faculty for 3 years at the Yoga Academy in Australia where she was involved in teachers training, retreat management, curriculum development and taught Yogic immersion courses on a variety of topics. She has travelled and taught in China, Australia and India in diverse settings to a wide range of students. Currently Pragyadhara is the director of Yoga Education at Kawai Purapura Yoga Retreat where her roles involve designing, teaching on and administration the Integrated Yoga Teachers Training 200hr programs and overseeing and developing the 500 Hr specialized modules. 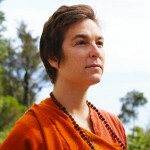 She is also one of the Lead Tutors on the NZQA Wellpark College, Diploma of Yoga. Brendon Sakey also brings a unique experience to the training. He completed his yoga teacher training through the Yoga Academy in Australia, under Bihar School of Yoga. His training and experience as a social worker merges the yoga practice with community and therapeutic settings. He has been teaching to a diverse range of people and understands that yoga can be adapted for everyone and therefore is passionate about sharing yoga where it is most needed. Brendon is a using yoga in many therapeutic settings, including drug and alcohol rehabilitation, hospice and prison. He shares his experiences out in the field, a knowledge and application of Restorative Yoga practice as well as current research and personal experience using yoga in the community. Other experts from their fields also join us in sharing the depths of these amazing practices. Is there anything else you would like to add about the training, or about Anahata? As I answer these questions, I am sitting on a busy street corner in Sydney, Australia. I look around me and people are running or speeding in their cars from here to there. Yep, like rats on a wheel…. These restorative practices and spaces like Anahata Yoga Retreat are a NEED in this day and age to give us a gap, a space, a pause….they allow us the opportunity to come back to centre so that we can manage the onslaught of life experiences and be healthy, happy and more present. These practices and spaces are like the water in the desert of a sometimes pretty crazy world and they are what keeps me inspired to do the work I do. In that light, I hope to have the opportunity to share with some of you soon. 21-30 April 2017 at Anahata Retreat. 4-22 April 2018 at Anahata Retreat. 24 January-1st February at Kawai Pura Pura Retreat. This course will equip aspirants and practitioners with skills and techniques for self-support as well as the tools to assist clients and or students to dismantle chronic tension patterns, enhance immune function, reduce physical, mental and emotional imbalances and return the body-mind to a natural state of ease and equilibrium. Practices applicable in a variety of fields and therapeutic conditions. Early Bird 10% discount ends 20th March, 2017 for Yoga Lunchbox readers only. Mention ‘Early Bird Yoga Lunchbox’ when you make your booking. Or click to email Anahata Yoga Retreat for an information booklet and application form. 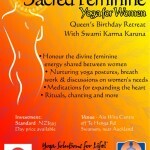 Swami Karma Karuna is a founding member and director of Anahata Yoga Retreat, New Zealand, and a dedicated, intuitive yoga teacher with more than 25 years of experience. From an early age, she travelled worldwide exploring diverse spiritual traditions, including in depth yoga certificate trainings in Nepal, India and Australia and 20 years living in and developing an integral residential yoga retreat. Swami Karma Karuna has released several practice CDs and tracks; including Hatha Yoga guided classes, health class, chakras and seed sound practices, Yoga for Women tracks, Yoga Nidra-deep relaxation, Inner Silence Mindfulness Meditation and prana practices.